Melodic guitar leads start off the album before going into a faster direction which also introduces blast beats onto the recording while the vocals are mostly grim sounding black metal screams that also have a touch of death metal to them and all of the musical instruments have a very powerful sound to them. Throughout the recording you can also hear a great mixture of slow, mid paced and fast parts while the riffs also bring in a great amount of melody along with the acoustic guitars bringing in elements of folk music when they are utilized as well as a couple of tracks being long and epic in length and as the album progresses a brief use of clean chants can also be heard. On this recording Heathen Foray remained very true to their melodic style of viking black metal, the production sounds very professional while the lyrics cover Norse/German Mythology, Paganism, Fantasy and Battle themes. 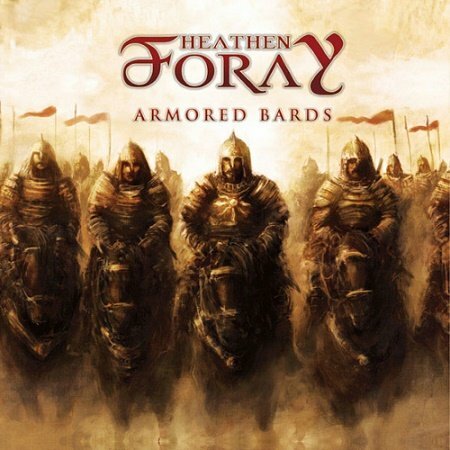 In my opinion this was another great sounding recording from Heathen Foray and if you are a fan of viking black metal, you should check out this re-issue. RECOMMENDED TRACKS INCLUDE "Armored Bards" "Messenger Of God" "Walls Of Vienna" and "Carthage's End". 8 out of 10.